1st lunar month of 1788: he made his debut on stage (hatsubutai), in Ôsaka at the Kado no Shibai, where he played the role of Yasuna's son in the drama "Ashiya Dôman Ôuchi Kagami"; the role of Kuzu-no-Ha was played by his father Nakamura Noshio II. 11th lunar month of 1794: Kinzô became zamoto and produced at the Kado no Shibai the kaomise drama "Tatematsuru Chibako no Tamamono". 20th day of the 3rd lunar month of 1800 : his father Nakamura Noshio II died. 4th lunar month of 1800: he performed at the Kado no Shibai the leading role of the dance "Omokage Musume Dôjôji", which was staged to commemorate the passing away of his father Nakamura Noshio II. 9th lunar month of 1802: Nakamura Kinzô I took the name of Nakamura Noshio III at the Naka no Shibai, performing the leading role of the dance-drama "Hanabusa Katami no Shakkyô" which was staged to commemorate the 16th anniversary (17th memorial service) and the 2nd anniversary (3rd memorial service) of the passing away of Nakamura Tomijûrô I and Nakamura Noshio II. 11th lunar month of 1802: Noshio performed at the Kitagawa no Shibaiin the kaomise drama "Fûryû Kokusen'ya", which celebrated the shûmei of Nakayama Shinkurô III; his stage partners were Ichikawa Danzô IV, Arashi Kichisaburô II, Arashi Sangorô III, Nakayama Bungorô I, Sawamura Kunitarô I, Matsumoto Yonesaburô I, Kanô Minshi I and Yoshizawa Iroha I. 1st lunar month of 1803: Noshio's rank in the Kamigata hyôbanki, wakaonnagata section, was jô-jô (superior - superior). He shared the same rank with Yoshizawa Enjirô I. 11th lunar month of 1803: Noshio became zamoto and produced in Ôsaka at the Kado no Shibai the kaomise drama "Hatsu Yagura Kogane no Manmaku", in which he played the role of the keisei Naniwazu and which starred Kataoka Nizaemon VII, Nakamura Utaemon III, Arashi Kichisaburô II, Segawa Rokô III, Sawamura Kunitarô I, Kanô Minshi I, Yamashita Yaozô I, Nakayama Hyôtarô I, Seki Sanjûrô I, Ôtani Tomoemon II, Asao Tomozô I, Nakamura Kumetarô II, Ôtani Tokuji I, Yoshizawa Enjirô I, Arashi Izaburô I and Mimasu Matsugorô. The troupe moved to the Kita no Shinchi Shibai in the 12th lunar month to perform the same program for 10 days. 1st lunar month of 1804: Noshio produced in the same theater the ni-no-kawari drama "Keisei Hako Denju". 8th lunar month of 1804: Noshio produced in the same theater the dramas "Hade Kurabe Ise Monogatari" and "Shinpan Utazaimon". 9th lunar month of 1804: Noshio produced in the same theater the drama "Ashiya Dôman Ôuchi Kagami"; the role of Kuzu-no-Ha was played by Segawa Rokô III who celebrated his coming departure to go to Edo. 10th lunar month of 1804: Noshio produced in the same theater the drama "Monogusa Monogatari". 11th lunar month of 1804: Noshio performed at the Naka no Shibai in the kaomise drama "Minoriyoshi Kane no Naruki". The troupe moved to the Kita no Shinchi Shibai to perform from the 24th day in the drama "Taiheiki Chûshin Kôshaku"; Noshio played the role of Okyô. 1st lunar month of 1805: Noshio's rank in the Kamigata hyôbanki, wakaonnagata section, was jô-jô-(shiro)hankichi (superior - superior - (white) half excellent). He shared the same rank with Yoshizawa Enjirô I and Ichikawa Dannosuke III. 11th lunar month of 1805: Noshio performed at the Kitagawa no Shibai in the kaomise drama "Shinshû Kawanakajima Kassen". 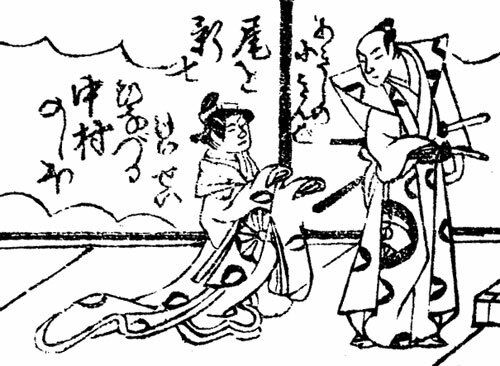 11th lunar month of 1809: Noshio performed at the Kitagawa no Shibai in the dance-drama "Sugata no Hana Musume Dôjôji", which commemorated the memory of late Nakamura Tomijûrô I. No record in ôshibai afterwards. 11th lunar month of 1817: his younger brother Nakamura Kyôjûrô III died. 4th lunar month of 1831: Noshio was back in Ôsaka from Kyûshû in order to perform at the Kado no Shibai in the dance-drama "Kyôganoko Musume Dôjôji", which was staged to commemorate the 49th anniversary (50th memorial service) of the passing away of Nakamura Tomijûrô I. Noshio took part in the kôjô in the first day but he fell ill.
13th day of the 4th lunar month of 1831 : Noshio died. Nakamura Noshio III was a Kamigata onnagata actor, who was active from the end of the 1780s to the beginning of the 1830s. He excelled in both jidaimono and sewamono, was also good-looking and had a good kôseki (good voice and good at delivering lines). He stopped performing in ôshibai from 1810 and was active in hama shibai, miyaji shibai and tabi shibai. He was exceptionally back in ôshibai in 1831 the day before his sudden death. The 13th day of the 4th lunar month of the 2nd year of the Tenpô era was the 25th of May 1831 in the western calendar. The 20th day of the 3rd lunar month of the 12th year of the Kansei era was the 13th of April 1800 in the western calendar.